And so another foolish fear bites the dust. Turns out texting with shortened words doesn't actually make kids stupider and worser at there literassy skeels. From ars technica - Study confirms TXT SPK doesn't hurt kids' language skills. "According to a study published in the March 2009 issue of the British Journal of Developmental Psychology, children who use "textisms" on mobile phones tend to have a better grasp of (normal) word reading, vocabulary, and phonological awareness, even when controlled for age, memory, and how long they have owned a phone." So, here's the part that I find interesting. How did this whole txting thing even start? There was NO "course" for kids to take. 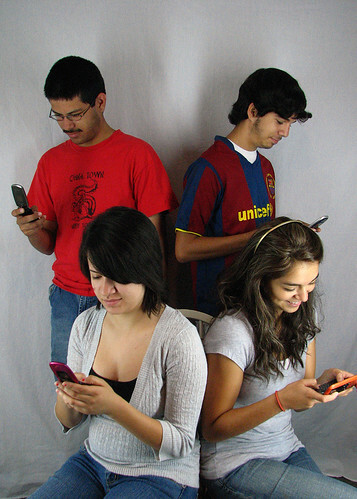 Heck, I know parents that use txt spk to communicate with not only their kids but business partners as well. I know they didn't take a course on it either. Yet, everyone knows and understands most of what is said in a msg written in this shorthand. Is this a new literacy that WILL be taught at some point? Will it end up being part of the English curriculum? Do we care?